Can I also generate a wind load on roof overhangs using the load generator? If the load generator is used for simple and fast generation of wind loads, for example, for a hall with roof overhangs, it is possible to consider the load on the roof overhang. 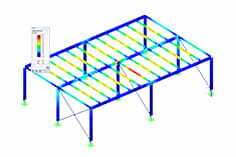 The data are entered separately for the base geometry of the building (without the roof overhang) and the roof geometry (with the roof overhang). The input dialog box is shown in Figure 01. 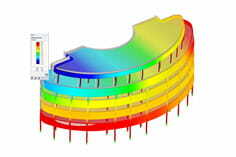 The program determines the roof overhang from the difference and applies the load accordingly (see Figure 02).